This is the wikipage for Hexagon's rpg club saga campaign for the school year 2016-17. The campaign is played in GURPS, with the After The End (1 & 2) supplements. The pages for the campaign will be a work in progress for as long as the saga is running, and more material will be added with the campaign progresses. We will put up news on this home page when important things happen. 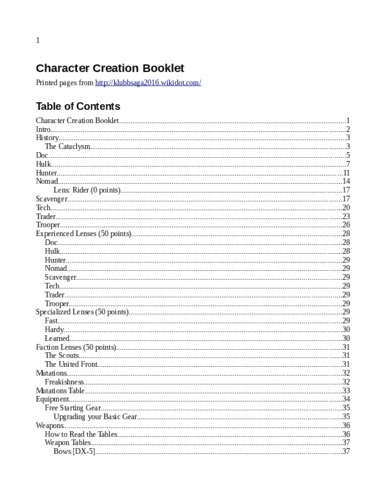 The different sub-pages contain what you need to create a character. 2017-06-21: The campaign is officially over, but we'll be running an epilogue plot this week. It'll briefly cover the events of the next year, including the Roman Civil War, contacting survivors around the world (and literally around the world1), clearing up (and looting) the corrupted lands around Geneva, and, yes, eventually going to space. 2016-08-22: Official dates for the campaign: 24. August is the first day of this years campaign. The main focus this day will be character creation, but for those with generated characters there will be possibility to play. 31. August we will have a GM available for those still not done with their characters.